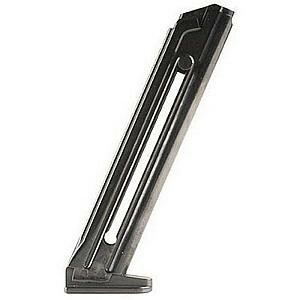 This replacement magazine is a factory original from Browning. Factory replacement parts are manufactured to the exact same specifications and tolerances and use the same manufacturing materials as the original parts which guarantees excellent fit and reliable operation. Includes thumb stud to make reloading easy as well as a window to view the rounds in the magazine. Note: These are "new style" magazines with the wider base plate. Will not fit flush with the grips of the original style Buckmarks.